If you have an existing WOC Gateway already connected, then select it here. If you have an existing WAVE Gateway that is not yet connected to WAVE OnCloud then enter the Device Code and Device Name here. You will find this information on the setup page for the hardware. To access the setup page, connect the WAVE Gateway Hardware via WiFi. Open a web browser on the PC and enter http://192.168.173.1/ (for Dell 3040 Gateway hardware) or http://192.168.137.1/ (For Dell 3050 Gateway hardware). The WAVE Gateway main interface opens in the web browser. The Device Code will be located at the top of the page. The Device Name will be listed as Machine Name in the Hardware section under System Information. If you have an existing Radio System already defined in WAVE then you can specify the system here. If you are creating a new Radio System, then select the Type and Name of the Radio System. The name you select is up to you. WAVE will use the name you enter to identify your Radio System to you throughout the interface. Enter the Talk Group ID range (start and end). This reserves the IDs used for the radios connected to WAVE. Broadband units will be prevented from using these IDs. Enter the Start and End range for WAVE Users that will become Radio Subscribers of the Radio System. WAVE Radio Subscribers are required for Private Calls (if supported by the Radio System). WAVE Subscribers also supply a unique ID to the Radio System. Specify an ID range that does not overlap with any IDs used by the Radio System. Enter a single anonymous ID that will be used to identify all WAVE Users who are not Subscribers. This ID is sent to the Radio System whenever a WAVE User that is not a Subscriber transmits to the Radio System. Enter a unique ID to identify this radio system. The value you enter must not occur in the radio system. Enter the IP Address for the MNIS Voice Manager. In the Capacity Max radio system, this is the VRC Gateway IP. Enter the Port for the MNIS Voice Manager. In the Capacity Max radio system this is the Server TCP Port. In the DDMS Watch Port field, enter the receiving network port for the Capacity Plus presence notifier. This is only required if NAI Data is enabled on the Radio System. If your Capacity Plus system does not use NAI Data, then leave this field blank. Select any existing Broadband TalkGroups that you want to add to your Radio System. Enter the name of a new TalkGroup and then click Create and follow the steps to create a new Talkgroup. The Group Name you specify will only appear to Broadband clients. In TalkGroup ID, enter the ID of the TalkGroup as it appears in the Radio System. If Site is available, select the Site as it appears in the Radio System. 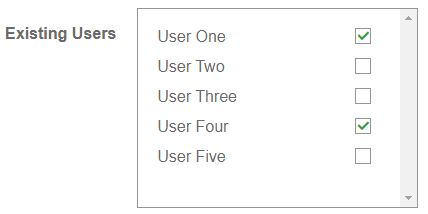 Select any existing Users to add. Enter the Display Name of the new User. This name will appear to WAVE Users in Broadband clients. Enter a User Name in the next field. This name will be used to sign-in to WAVE. Click Create and follow the prompts. If the new user is a Radio User, then enter the Unit ID of the User. Select Allow Private Calls to Radios if you wish to allow this user to initiate or receive Private Calls with Radio Units. This does not affect Private Calls with other Broadband users which is active by default.